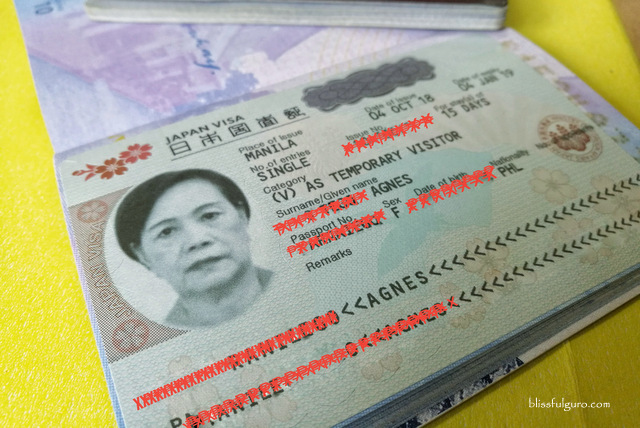 This post has been updated with additional narrative on how I got a multiple entry visa on my second application and how my mom (a senior citizen) got her visa for the first time using my documents as her guarantor, all in just two processing days. Japan has always been a dream destination for some Filipinos. Whether it’s because of animė or ramen, it’s always included on their bucket list because of its close proximity to the Philippines. I have applied for a Japan Tourist Visa under the category of Visa for Tourism (No Guarantor) and thankfully, I was approved. Check out my easy breezy application with some tips on how to ace it. Just this year, I had the opportunity to visit Seoul which prompted my first ever Tourist Visa Application for South Korea. It was nerve-wracking considering that once I get denied, it will take another six months for me to re-apply. But then again, just like my first ever visa application, as long as you provide all the necessary documents and fill out the application form legibly and honestly, your Japan dreams will be one step closer (check here for discounted tours, transportation and activities in Tokyo). After scoring a good deal on airfare, me and my buddies took the necessary steps to secure Japan Tourist Visa. Here's how. 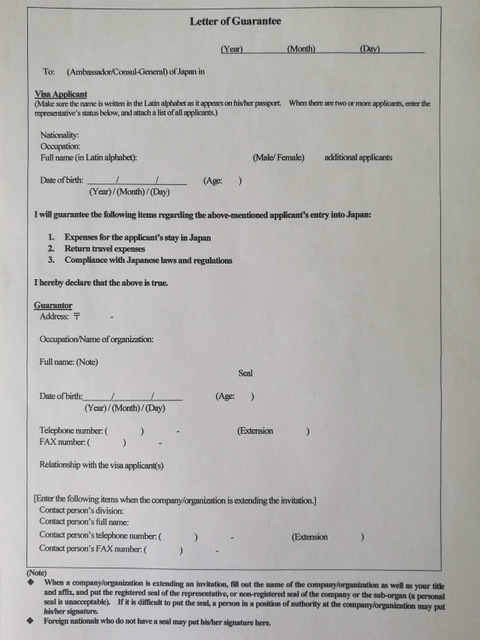 When applying for a Japan Tourist Visa in the Philippines, there will be set of requirements needed for specific individuals such as Visa for Tourism, Visit Friends or Distant Relatives, Visa for Visiting Relatives, Visa for Commercial Purpose, To Attend Conference by Private/Public Organization, Visit Relatives/Friends Invited by US Military Personnel, Visa for Spouse of a Japanese National, Official/Diplomat, Visa for house servant hired by Official/Diplomat, Visa for application with Certificate of Eligibility Issued in Japan, Visa for Transit, Visa for Medical Stay, NIKKEI-JIN (Japanese Descendants), Visa for Filipino Parents of Japanese-Filipino Children (JFC) who are traveling to Japan with the children, and Single-Entry Tourist Visa for Philippine Nationals Joining Package Tours Organized by Registered Travel Agencies. For this guide, I will only be tackling about my experience when I applied for Japan Visa under the category of Visa for Tourism (No Guarantor).For the requirements of other visa types, please check out the Official Website of the Embassy of Japan in the Republic of the Philippines. INCOME TAX RETURN (Form 2316) – latest and clear photocopy. I went back to Reli Tours and Travel and got back my passport with my approved Japan Tourist Visa attached to it. 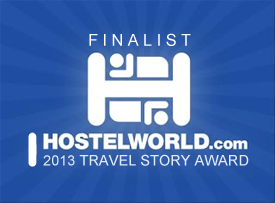 Flight and hotel bookings are not required specifically when you fill out the application form. Make sure that you have enough money in your bank account that will prove your capacity to fund your trip. Proof of strong ties with the Philippines can be established by providing your old passports that will show your travel history. As suggested by the agency, applicants should file their visa applications personally for smooth transaction. But if you are traveling with a group, one representative could file everything as long as an authorization letter from each applicant is provided. No appointment is needed for the application of the visa. But take note of the office hours of the agency you’re seeking. All original and photocopied documents that will be used on the application will not be given back to the applicant. You will also be leaving your original passport at the agency and you may also bring your old passports just to be sure that you have it when they ask you to present it. As advised, the processing time can be from two (2) to twenty one (21) days depending on the screening by the Embassy of Japan in the Philippines. Single-entry visa is valid for a stay no longer than fifteen (15) days and is valid for 90 days upon issuance. 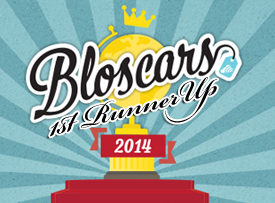 So make sure that your visit will not exceed fifteen (15) days if it will be your first application. Multiple-entry visa is usually valid for five (5) to ten (10) years depending on the approved visa. You are allowed to stay fifteen (15) or thirty (30) days per visit depending, again, on the permitted visa. Should you wish to apply for a multiple-entry visa, you need to submit a form of reason with attached documents for qualification which you may download here. If you have a previous approved tourist visa from Japan, you still need to prepare the same documents as mentioned above except for birth certificate and (if there’s any) marriage certificate. Please do fill out the application form legibly and honestly with no erasures. I used block (all capital) letters in all of my responses. Don’t leave any item blank and put "NOT APPLICABLE" or "N/A" instead (this is very important). I’m meticulous when it comes to filling out any form. So just in case I would miss out on anything, I accomplished three sets of application forms and checked each set three times before going to the agency. Here are some of my specific responses on my application form. Other names – If you’re a single Filipina then put “NOT APPLICABLE”. If you’re a married Filipina, then you have to put your maiden name on the space provided. Former and/or other nationalities or citizenships – Just write “NOT APPLICABLE” if you are not a citizen of other country. ID no. issued to you by your government – Just write the number of any government-issued ID (ex. LTO, PRC, etc.). Purpose of visit to Japan – I wrote “SIGHTSEEING”. Port of entry into Japan – Write your intended port of entry. I wrote “NARITA INTERNATIONAL AIRPORT”. Guarantor or reference in Japan – If you have no guarantor just put “NOT APPLICABLE” on EACH item. Inviter in Japan - If you have no guarantor just put “NOT APPLICABLE” on EACH item. *Remarks/ Special circumstances, if any – I put “NOT APPLICABLE”. 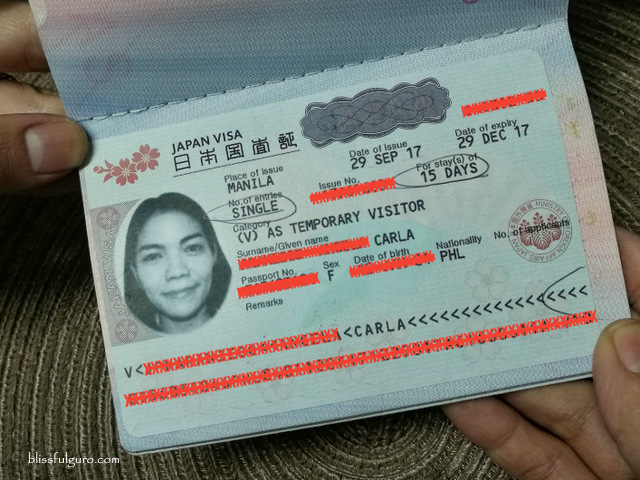 Applying for a Japan Tourist Visa in the Philippines is easy as long as you submit all the required documents and should fill out the application form legibly and honestly. The key here is to prove your capacity to travel and the proof of strong ties in your country or lemme say an assurance that you have reasons to go back to the Philippines. It was last week when my mom suddenly had this urge to go to Japan, out of the blue. Being a widow for eight years now, I somehow had this unspoken duty of making her (extra) happy. And just last year, me and my buddy started to let our moms experience our backpacking life by joining them on the Malaysia leg of our backpacking trip, this year, we showed them Bali. My mom considers Japan as one of her dream destinations, and hopefully, our impulse trip would go as planned. So first things first, the visa. In just two days, I managed to prepare all our documents and was able to apply for a tourist visa for the both of us. Two days right after our application, we had our passports back with the visa sticker on it, my mom was elated. I already shared my experience on obtaining a Single Entry Tourist Visa in Japan on this same post last year. It was easy peasy as I had all the required documents with me at that time. So now, the challenge was to get visa not only for me but also for my mom using my documents. 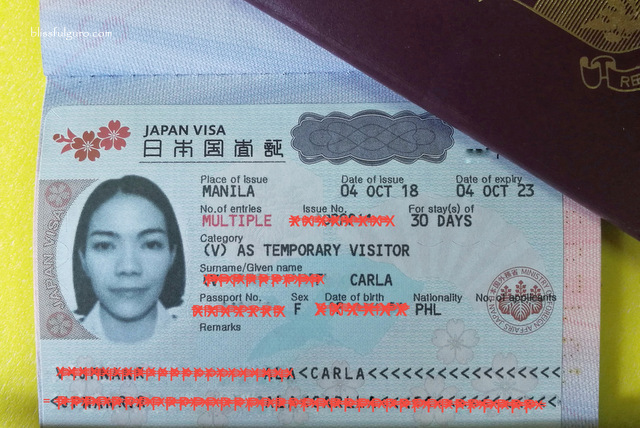 Carla – 34 years old, public school teacher (10 years) with previous travel to Japan and other countries, with an account of a little more than P100,000 in the bank, married a few months ago but still haven't got hold of my PSA Marriage Certificate so I indicated that I am single. Agnes – 63 years old and a widow with a monthly pension with no savings account in the bank. She has a few stamps on her current passport as well as an expired U.S. Visa (multiple-entry for 10 years) on her old passport. The challenge here was to get approved visas for the both of us using only my documents as proof of financial capability to support our travel (which will always be the case if you’re applying for a visa with no sponsor, third world passport problems, I know). 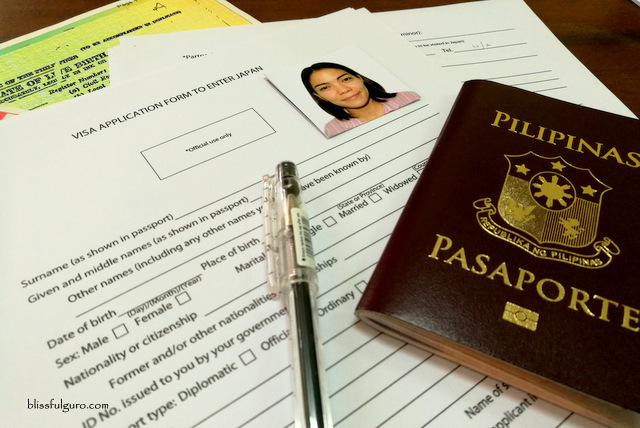 BIRTH CERTIFICATE – should be original, and issued within one year from Philippine Statistics Authority (PSA). I didn't need to submit this because I already provided it on my first application thus, it will not be necessary for the second application. But, I will be a guarantor for my mom on this particular application so to prove our relationship, I needed to submit this again. I just got married so I didn't still have my Marriage Certificate at the time of the application and I indicated Single on the Gender. OLD PASSPORT – Containing her expired U.S. Visa (Multiple-entry for 10 years). LETTER OF GUARANTEE – I downloaded the form here and filled out the required items. BANK CERTIFICATE – original and submitted within three (3) months from the date of issue. Other names – I put my mom's maiden name on the space provided. ID no. issued to you by your government – I wrote my mom's senior citizen number. 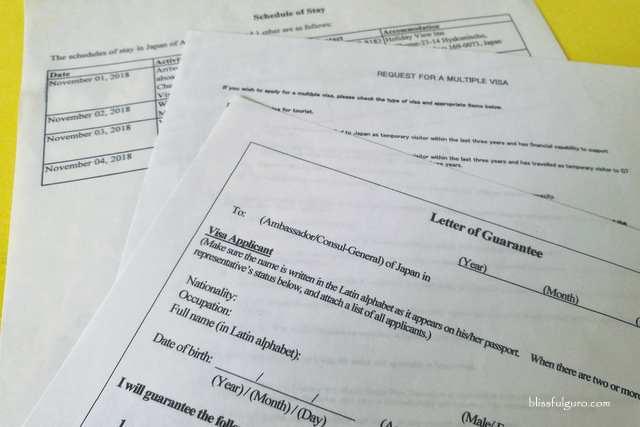 Guarantor or reference in Japan – I put “NOT APPLICABLE” on EACH item because I will be the sponsor of my mom and I am not living in Japan. This item will only be for applicants who do have guarantors in Japan. Inviter in Japan - I put “NOT APPLICABLE” on EACH item. Day 1: I requested for a copy of Form 1236 (ITR) from our office which I got the same day. I filled out our application forms carefully and thoroughly without missing any item. I gathered all the necessary documents which I planned to file the next day. Day 2: I went to my bank and asked for a Certificate of Deposit and Investment which I got the same day. After which, my mom and I went straight to Reli Tours and Travel at Dusit Thani Hotel in Makati to personally submit our application (this is very important, if you can personally submit it then it will be better). I aced the screening process and proceeded to pay the service fee of P950 each per application and was given a claim stub with receipt. Day 3: I didn't get any news about the application. Day 4: I received a text message from Reli Tours around nine in the morning that our passports were ready for pick-up. My mom couldn't join me so I prepared an authorization letter signed by her plus two (2) valid id's from her (they didn't ask for it though but it was better to be prepared). That same afternoon, I went to their office and was given our passports with the approved visas. As with my former visa applications, I always expect the worst and hope for the best. This particular visa application was special though as my mom's happiness was at stake. And seeing the smile on my mom’s face when I handed her passport is totally priceless. Hi Carla! May I just confirm that your mom did not have to submit the death certificate of your father? My mom who is also widowed will be applying for tourist visa soon. Just want to make sure she does not have to submit my late dad’s death certificate. TIA!